Admiral Flota Sovetskovo Soyuza Kuznetsov, constructed at Nikolayev South Shipyard in Nikolayev, was launched in 1985, and became fully operational in 1995. An official ceremony marking the start of construction took place on September 1, 1982; in fact she was laid down in 1983. The vessel was first named Riga, but in November 1982 the name was changed to Leonid Brezhnev, in August 1987 to Tbilisi, and finally on October 4, 1990 to Admiral Flota Sovetskovo Soyuza Kuznetsov, referred to in short as Admiral Kuznetsov. The ship was 71% complete by the summer of 1989. In November 1989 she undertook her first aircraft operation trials. In December 1991, she sailed from the Black Sea to join the Northern Fleet. Only from 1993 on did she receive aircraft. 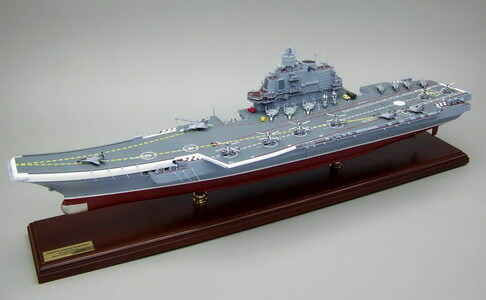 Kuznetsov made a brief Mediterranean training cruise early in 1996. At the end of 1997 she remained immobilized in a Northern Fleet shipyard, awaiting funding for major repairs, which were halted when they were only 20% complete. The overhaul was finally completed in July 1998, and the ship formally returned to active service in the Northern fleet on November 3, 1998. The Kuznetsov apparently remained in port for about two years before participating in operations related to the rescue and salvage of the Kursk submarine in late 2000. Plans for further operations were postponed or cancelled. In late 2003 and early 2004, the Kuznetsov went to sea for inspection and trials. In late October 2004, she participated in a fleet exercise of the Russian navy in the Atlantic Ocean, and again in September 2005. During the 2005 exercise, one of her Su-33 fighters was involved in an accident, and fell from the carrier into the Atlantic Ocean. Although financial and technical problems have resulted in limited operations for the ship, it is expected that Admiral Kuznetsov will remain in active duty until at least 2030. Mahogany wood. Scale: 1/350. Length 34 inches.